TMNT Fan-Comic. Leonardo mutates into a turtle-dragon. OMG! I've waited so long for this!!! But this comic.... 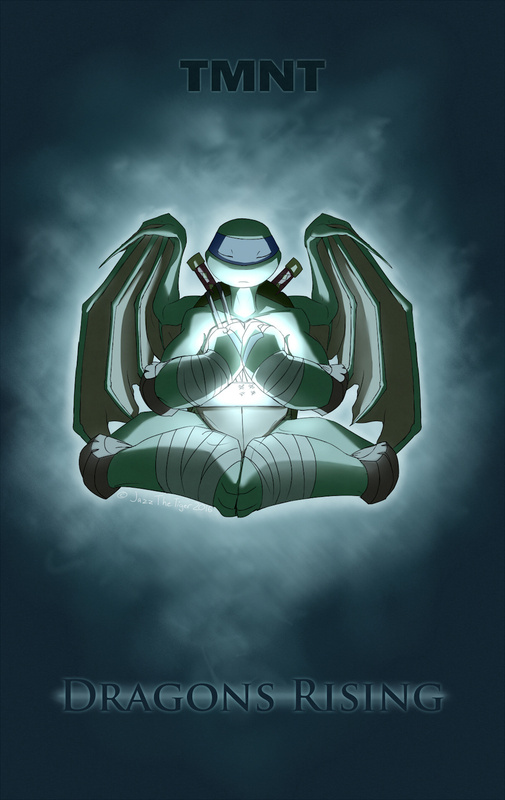 This is a prayer come true ^^ I've seen the cartoon when the turtles turn into dragons, but they don't do that enough for a dragon-fanatic like me. Please, please tell me that you're continuing with this, that there's gonna be more. I love it so much! Your art style is simply mesmerizing! Awesome! Yes... YES!!! It's ALIVE! Yeah! Finally! This thing is so awesome- a combination of TMNT and dragons?! It's like the INSIDE OF MY BRAIN! Ang you draw it so good! Thank you for reviving it! I can't wait to see where this is going! Is Leo gonna transform, or pass out, or what?! I have to know! you shall have to wait and see. Your dream was actually spot on for what I had planned. Except for the hybrid turtle/dragon part, 'cuz they're all hybrid turtle dragons. I'll have to change it now! What the- well... that kinda freaks me out a little o_o he he! and I haven't even gotten to the good parts yet! aah thank you X3 and I haven't even gotten to the good parts yet! 2k12 definitely seemed childish from the beginning, but if you follow the series you'll know differently. DX The latest episode.. it ruined me. I laugh at the part where mikey said "Growing tattoo? Must be the avatar....." but then l real life that Leo looks like the avatar that use to watch. So painful... but it looks exquisite !!! Wow.so is painful when doing it for the first time? Then for the second not so much? Looks soooo good!! How the hell are you doing this?! Eeeppppp!!!!! I can't wait for more!!! Hmm... I could do without all the blood... but otherwise awesome job! Leo looks like he would be in pain. Yes!!! Another page! I've been waiting so long for this... I'm so happy! How does this comic end? This is like the best A.U comic I've ever seen! You gotta continue this!!! I'm gonna guess because of the timeline of the comments, things aren't going your way to continue this?